Known as Brockington Hall. 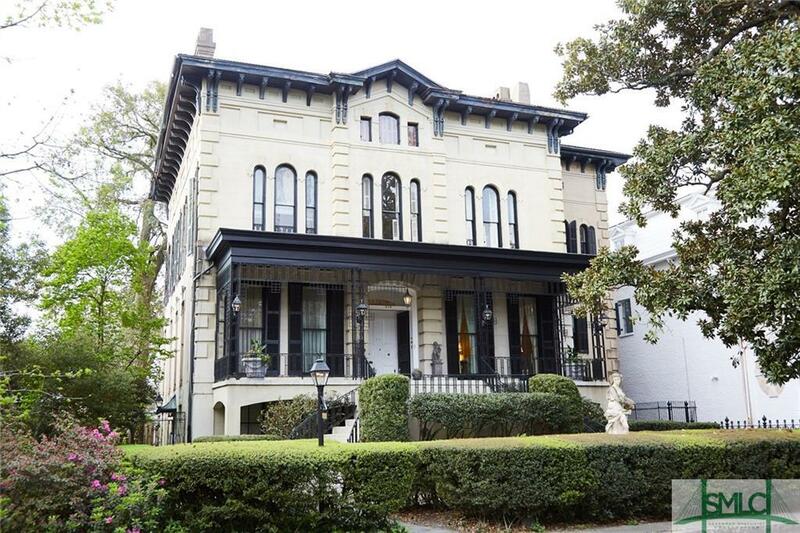 Overlooking one of Savannahs loveliest brick-paved streets, this extraordinary Italianate Villa-styled 4-story house, c. 1882, consists of over 12,000 sq. ft. Presently configured as 8 apartments and a large wedding and event venue, it is known for its distinctive Chinese Chippendale ironwork and for the marble mantels, lovely mirrors, tall windows, period moldings, chandeliers, and 14 ceilings on the parlor floor. Three floors are accessible by elevator. One apartment is housed in a separate 542 sq. ft. building and parking is provided by the driveway and two rear parking spaces. Listing courtesy of Casey Schivera of Celia Dunn Sotheby's. © 2019 Savannah Multi-List Corporation. All rights reserved.